Crabgrass Goes Where It's Invited... Learn To Slam The Door Shut! CRABGRASS? Give It 30 Days Notice! You can get rid of it …eventually! Crabgrass causes an impressive headache to gardeners and lawn care professionals alike. Are you tired of this recurring struggle? Is this truly the enemy you fight, or could it be some other nemesis like bermuda grass? You face a difficult battle, with no ‘Easy-1-2-3-Solution’. But if you are willing to attack the problem with persistence, and a logical approach, then you can reclaim your domain from the grip of this formidable foe! The following series of articles on this site will tackle the nature of this enemy of the residential lawn, starting with crab grass identification and the numerous characteristics that make it such a successful survivor in every part of your yard and garden. This information will be detailed, easy to understand, supplemented with photos of weeds, and provide a systematic method for control. Sometimes it hurts to find out you’ve been tackling the issue all wrong, even making it worse or causing unintended consequences. You’ll recover, and hopefully your lawn will also. Now is the time to start fresh and make progress! Or is it Crab Grass? Spell it either way. Give it a space in the name — no big deal. Give it a space in your lawn? Trouble! Allow it in the smallest part of your yard or garden, and it takes root and takes over. The weed is called by many names in different parts of the country, sometimes referring to the actual weed, Digitaria Sanginalis or Digitaria ischaemum. But the label people use often is applied to any number of different varieties of weeds. Some of these names are: devil grass, quack grass, bermuda grass, goose grass, barnyard grass, and you may know a few more. The varieties, hairy or smooth, also make it more difficult to be sure the one you are looking at is the same as what different experts are describing (like your brother-in-law across the country). More significantly, the appearance of this master of disguises varies incredibly depending on the maturity of the weed, the growing conditions, the competition, and the availability of nutrients or water, plus a tendency to be just plain ornery! These are complimented by a written description provided in the article,What Does Crab Grass Look Like? Here you will learn what traits are most revealing of its identity, as well as some of the subtle differences between similar weeds, especially bermuda grass, the most common alternative. Your efforts at control will be enhanced by discovering how the growing conditions of the weed contribute to its establishment. Make the growing bed less comfortable for this unwelcome dude, and it won’t be so inclined to hang around! Those first two entries have started to get you familiar with the nature of this invader. Now let’s take a look at how it gets established in your lawn and garden, and why it rates as a super-weed, “The Incredible Nuisance”. Plan to follow the complete strategy for fighting it, with the appropriate technique or product, depending on how developed it is, the stage of growth when you first step into battle. Discover what happens if you skip a beat, or wait too long before working on the problem. It is not just a matter of spraying chemical on the plant, and then heading to the hammock for the remainder of the season. You need to consider what to do with the dead clump of grass and any deposited seeds. Then it’s on to the next step, and the next step, as you improve the conditions for your lawn grass, and make it less hospitable for this and any other weeds. Go to this Getting Rid Of Crabgrass information that explains what control methods are possible, and which are essential. Killing Crabgrass: What Works, & How Safe Is It? Most people assume, and rightly so, that the fastest or easiest way to kill crabgrass is by spraying a liquid chemical. Most people also make their first mistake before they even purchase the product they plan to use! Please save yourself a load of heartache, and a load of extra work, by learning when you should NOT use a particular weed killer. Find out if there is a better alternative that will be not only safer, but more effective, with fewer negative considerations. Are you dealing with a full blown infestation, a clump here and there, or just seeing it pop up anew? The timing and size of your problem will affect which method holds the best promise. And since many of you have concerns for kids or pets being exposed to most lawn care chemicals, investigate here how you can eliminate, minimize or live with the hazard of applying weed killer products. The way you apply a chemical herbicide, whether liquid or granular, will affect the outcome and the danger quotient. What time of day or weather conditions are appropriate for using a product to kill crab grass? It can make a critical difference with your success, and prevent a large amount of damage to your lawn or even its complete ruin. Consider in this article all the different ways you can successfully and safely Kill Crab Grass. A pre-emergent is one of the most critical components of your battle arsenal. Knowing When To Apply Crabgrass Preventer is just as important as knowing what type to use, where to use it. Also be aware there are situations when you should NOT apply a preemergent. (A seed growth preventer might impact root growth). Thankfully there are some factors in your favor here. Visual clues can be quite helpful in determining when to make an application. Most areas of the country have local resources available to help you be ready for the optimal time. One nice thing about crabgrass (probably the only one for residential lawn care providers) is that this pesky weed is more accommodating of your procrastination tendencies than all other types of lawn weeds. PreEmergent for Lawns: A User’s Guide To Weed Prevention. Using Pre Emergent Herbicides: Can You Still Plant Grass Seed or Sod? What About St. Augustine Lawns? A very popular grass in warmer climates is St. Augustine, which also has specific varieties known as Floratam, Palmetto, and others. Those balmy locations happen to be very conducive to weed growth and everything else. So they probably rely greatly on these weed killers for crabgrass control, right? Nope. Make that a capital NO! Don’t do it! Don’t even think about using Crab Grass Killer for St. Augustine Lawns! Now that I’ve garnered your attention, I’ll admit that there are exceptions. So consider the alternatives discussed in this article before you meander off to buy the first thing you see on the nursery department shelf. Product Labels these days are devious, and as always, the fine print is hidden. Marketeers want you to buy their product based on looking at one or two words, a catchy slogan, or a flashy photo. I want you to buy only what will work and not something that will be at minimum a major mistake. Most of you will be disappointed at the options in this category, so you might as well know that from the outset. But you might be fortunate. There’s even a new formula herbicide that is environmentally responsible, which might be just the answer for some of you. And don’t neglect to investigate the Question and Answer pages below for some insight into how you’ll be addressing the need to rejuvenate your St. Augustine lawn after these crabgrass control methods. This relatively new addition to the Garden Counselor website, will further clarify the features in the articles. These responses to actual inquiries from individuals like you are very useful to visualize your own situation, and see how the tactics unfold. As you well know, your results may vary, and every situation is different. When things are not clear, it’s always good to seek clarification. The following links are a series of ongoing additions to this collection, as readers inquire about a specific approach with their yard problems. Enjoy these interactions with some of your neighbors near and far, as we embark on the best methods to control crabgrass. 2. Can I Use Crab Grass Killer on New Grass? 3. 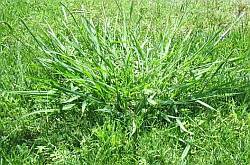 Is Treating Crabgrass O.K. When It's Hot? Do you have a unique circumstance? Having trouble making sense of the whole situation? Wondering if it’s worth the expense or effort to embark on this chore? Feel free to Contact the Garden Counselor if you need some personalized advice. We do our best to respond as promptly as possible, (but please be gracious during prime gardening season). (Editor’s note: The volume of mail we receive is significant. Before contacting us, please read all the related pages introduced above, and the FAQ, and use the Search feature on the NavBar above to find a keyword in all articles on this site. We then welcome the opportunity to serve you, as the subsequent answer to your concern may become a new entry that helps many others!) Thank you!